Engineering controls eliminate or reduce exposure to a chemical or physical hazard through the use or substitution of engineered machinery or equipment. 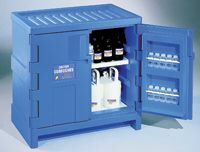 Examples include self-capping syringe needles, ventilation systems such as a fume hood, sound-dampening materials to reduce noise levels, safety interlocks, and radiation shielding. When substitution of hazardous chemicals or processes is simply not possible, additional measures to control employee exposure need to be taken. While personal protective equipment (PPE) such as respirators can help protect an individual from a hazardous material, engineering controls protect all workers by reducing or eliminating the hazard. For example, someone who is spray-painting can wear a respirator to avoid inhaling toxic fumes, but nearby workers without any respiratory protection will be exposed. Through the use of proper local exhaust ventilation everyone can be protected. "...administrative or engineering controls must first be determined and implemented whenever feasible. When such controls are not feasible to achieve full compliance, protective equipment or any other protective measures shall be used to keep the exposure of employees to air contaminants within the limits prescribed in this section. Any equipment and/or technical measures used for this purpose must be approved for each particular use by a competent industrial hygienist or other technically qualified person. Whenever respirators are used, their use shall comply with 1910.134. Note: In certain circumstances, administrative controls can be successful in controlling employee exposure to contaminants; e.g., maintenance operations involving toxic substances can sometimes be performed at night in the absence of the usual production staff (but not to comply with the PEL of OSHA-regulated carcinogens). 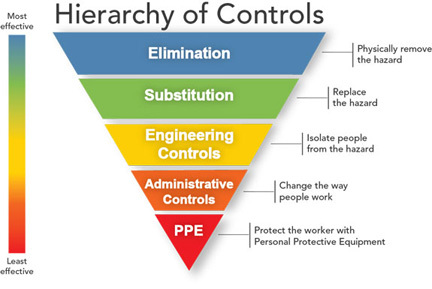 This does not mean that engineering and other types of controls (including PPE) are mutually exclusive. Employers may need to use multiple types of controls to prevent employee overexposure. Also note that the degree to which engineering controls are required depends on the particular standard. For example, 29 CFR 1910.95(b)(1) Occupational Noise Exposure, allows employers to rely on personal protective equipment (PPE) and a hearing conservation program rather than engineering and/or administrative controls if hearing protectors will effectively reduce the noise hazard to acceptable levels. When employers complain that implementation of engineering controls will present an unbearable economic burden, they must present evidence that addresses the reasonableness of the estimated costs of engineering or administrative controls. This includes installation, maintenance, and lost productivity, as well as their progress compared to their industry peers. The evidence may also include the relative costs of engineering or administrative controls versus PPE. In those limited situations where there are no feasible engineering or administrative controls, full abatement can be allowed by PPE. "Safety Engineering: Principles and Practices", Hardcover, 544 pages, 2004. Estimated price $109.00. Info and/or order. "Safety and Health for Engineers", Hardcover, 758 pages, 2005. Estimated price $82.60. Info and/or order. "Occupational Ergonomics: Engineering and Administrative Controls (Principles and Applications in Engineering, 14)", Hardcover, 627 pages, 2003. Estimated price $107.58. Info and/or order. "Hazard Communication Made Easy: A Checklist Approach to OSHA Compliance", Paperback, 310 page, 2000. Estimated price: $94.00. Info and/or order. "Control Systems Engineering, 5th Ed", Hardcover, 880 pages, 2007. Estimated price: $129.02. Info and/or order. Engineering controls may receive specific mention on SDS's. For example, when a material has a low PEL, there may be a section explicitly labeled "Ventilation requirements". Specific machinery may be recommended - or perhaps specifically discouraged. For example, ductless recirculating laboratory hoods might not provide sufficient protection from certain highly toxic materials; in these cases a properly vented fume hood (perhaps outfitted with a scrubber) would be required. Two of the most common engineering controls found on an MSDS are local exhaust and general ventilation. There are dozens of types of engineering controls. Hazard Prevention and Control at OSHA. Part of a very useful Safety & Health Management System e-Tool. Get an idea for the diversity and scope of engineering controls by examining these engineering control diagrams for lead smelters at OSHA. One of NIOSH's major programs is engineering controls. View the Program Description and then follow the links for much more information. The National Science Teachers Association offers a free download, "Safer Science: Building Safety with Engineering Controls" (free registration required). The Hazard Controls section of the Chemical Hygiene Plan at Lawrence Berkeley National Laboratory includes a discussion titled "Selection and Use of Engineering Controls". 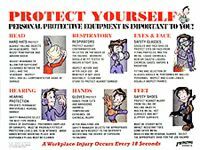 See also: administrative controls, fume hoods, respirators, personal protective equipment (PPE), ventilation.